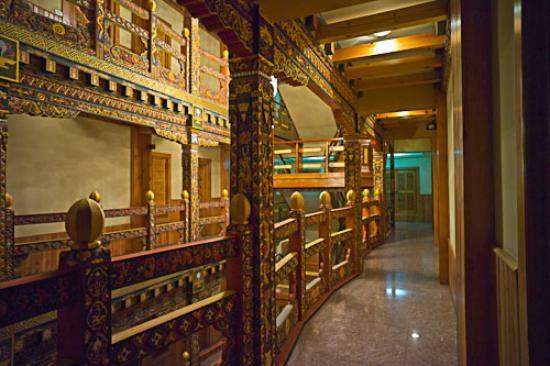 Namgay Heritage Hotel was built on the concept that guests come to experience the culture, history and the way of life of the people of Bhutan but deserve to do so in a manner suited to their sensibilities. 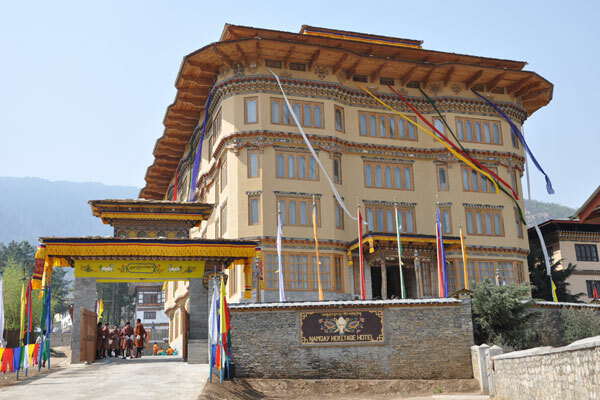 Modern comfort and traditional Bhutan are not mutually exclusive and Namgay Heritage Hotel takes great pride in that. The hotel also offers both a banquet hall with full catering service and a large conference hall able to accommodate more then two hundred people theatre style and up to fifty people round table style. The Conference is also equipped with a state of the art audio system and a VIP room for high profile guests. 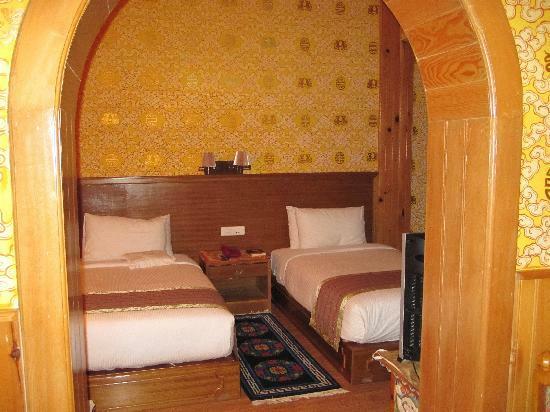 Each of the Namgay Heritage Hotel room are unique and equipped with requisite amenities like large queen size or two standard beds, tea / coffee maker, Cable TV, Mini Bar, two piece sofa set, Wi Fi Internet connection. Located on the third floor these two spacious suits are the best rooms in the hotel. 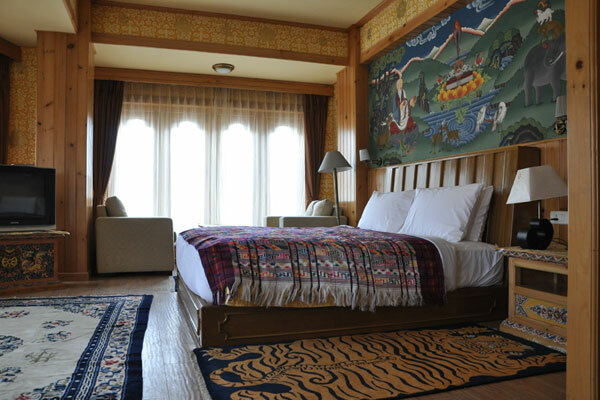 The suits consists of three rooms each, a sitting room furnished with traditional Bhutanese inspired furniture a changing room and a bed room with a king sized bed. 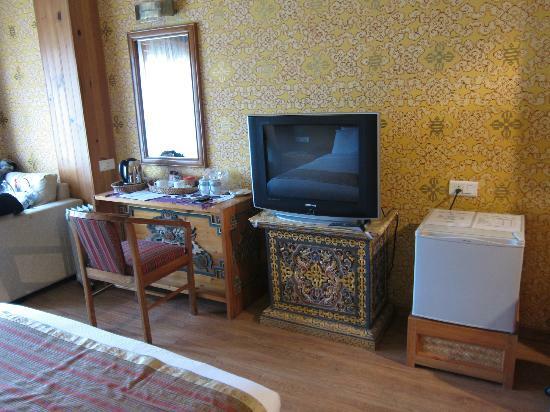 Both the rooms offer a panoramic view of the city of Thimphu. Facilities: Wi Fi Internet connection, Room Service, Cable TV, Mini Bar, Jacuzzi, in room tea/coffee maker and Meditation Throne. 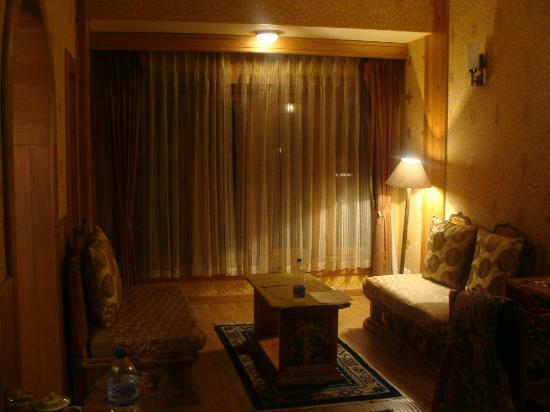 These rooms are located on the first, second and third floor of the hotel, ideal for guest looking for spacious rooms. 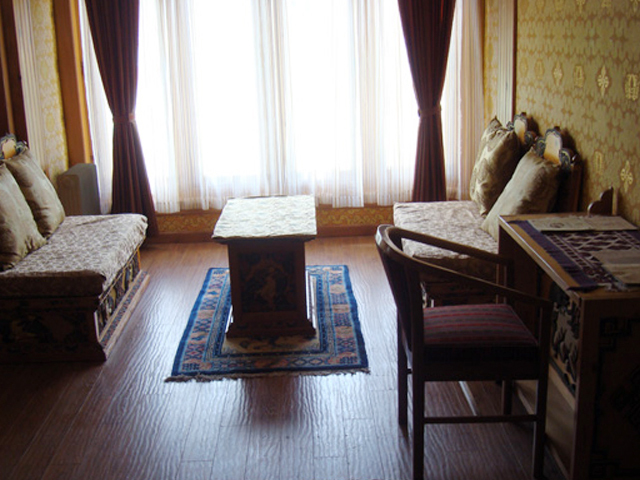 The deluxe offers a living room furnished with traditional Bhutanese inspired furniture and a bed room with two standard beds and sofa. Facilities: Wi Fi Internet Connection, Cable TV, Room Service, Mini Bar, in room tea/coffee maker. 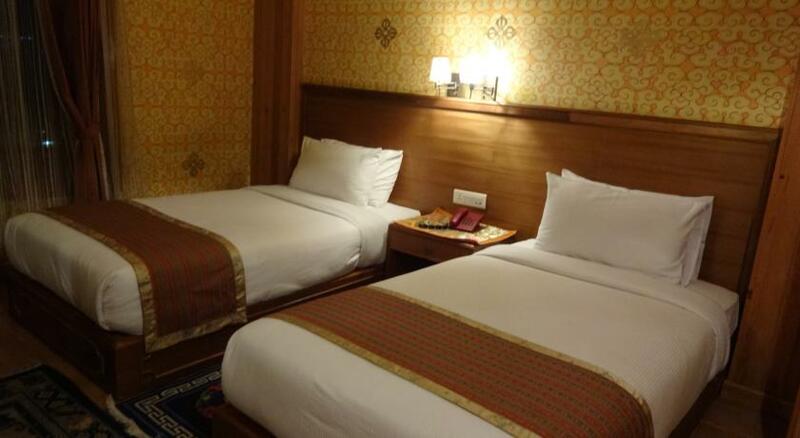 Standard rooms are compact and comfortable and are ideal for single or business travelers. The room is either furnished with a large queen sized bed or two standard beds along with a two piece sofa set. Facilities: Wi Fi internet Connection, Room Service, Cable TV, Mini Bar, in room tea/coffee maker. Continental Restaurant is situated to the right side of the reception and main entrance, the continental restaurant is an all day dining facility that offers a mixed cuisine menu. The restaurant offers a good selection of both continental and Indian cuisines. 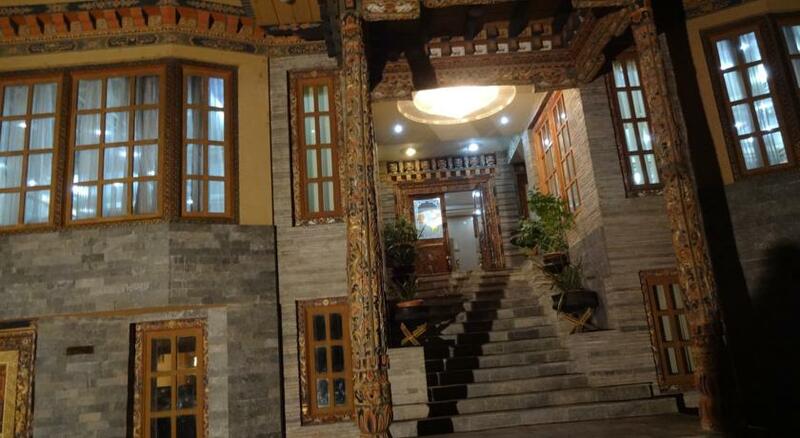 Bhutanese Restaurant will give you an experience of local Bhutanese cuisine. Located on the 4th floor of the hotel, the Bhutanese restaurant serves authentic Bhutanese cuisine in a Bhutanese inspired setting. The restaurant offers a wide range to Bhutanese cuisine from all parts of the country and a strong brand of Ara (Local Spirit) and is sure to be a delight for all food connoisseurs. Namgay Heritage Hotel offers a well set up and spacious Spa with trained masseuse offering various massages and body treatments. 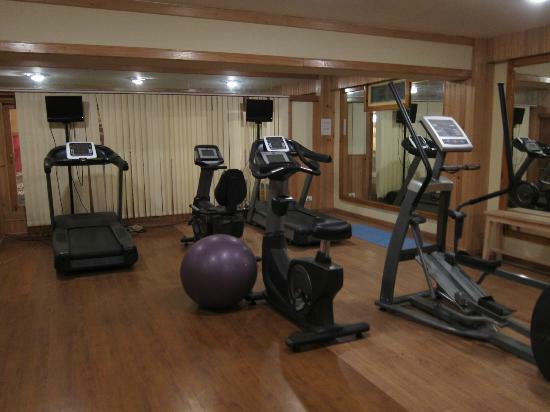 The spa is complimented with separate steam room and sauna bath cabinet for ladies. Use of steam and sauna bath cabinets is complimentary for hotel guests and Health club members of the hotel. 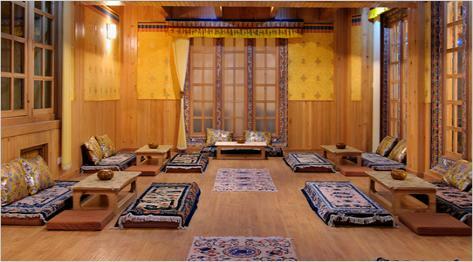 Located in the basement floor of the building, the “Chang-Khu” bar is a great place to relax after a long day of work. With its own roof shed of wooden shingles and huge wooden pillars and bamboo thatch walls, the bar is almost a separate house within the structure of the hotel. This results in a unique ambience quite apart from the rest of the Hotel, the feeling of visiting a rustic southern local bar.